As I mentioned in my earlier post An Elegant Finished Edge, I had come up with a use for the odd-shapped design that we had designed for our first test custom needlepoint canvas. 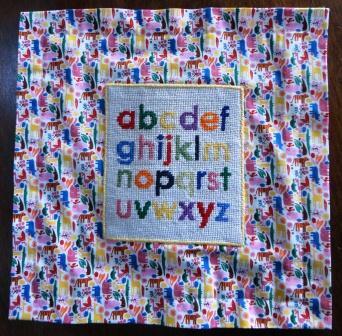 This 6″ x 7″ canvas is now the center piece of a 12′ x 12′ pillow for my granddaughter’s nursery. As you can see, this pillow does not have piping — the most difficult and frustrating part of needlepoing pillow finishing. Also, there is no zipper, no turning inside out, and IT IS EASY! It is a modified pillow sham which fits over a 12″ x 12″ pillow form. Cut one 18″ x 18″ front. 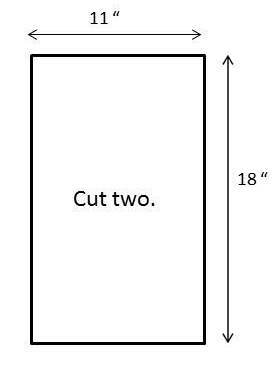 Cut two 11″ x 18″ piece for left and right sides of back. Position finished needlepoint canvas in the center of the front. Stitch in place by machine using zig-zag stitch or by hand using an overcast slip stitch. 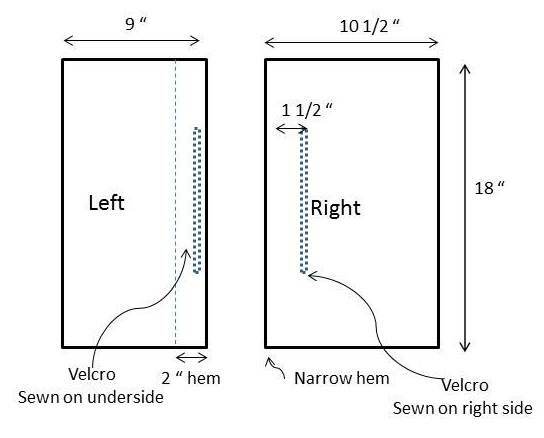 Place left back over right back to create a 18″ x 18″ square. 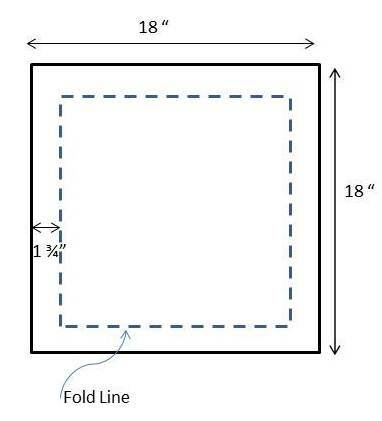 Fold under 1 3/4″ on all four sides of front and back and press with steam iron, mitering each corner. 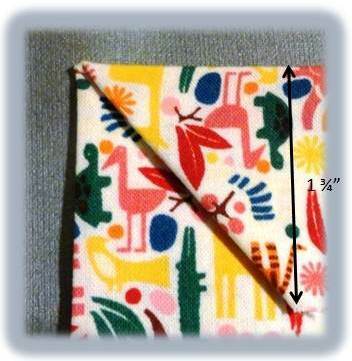 With wrong sides together, stitch around 1 1/4″ from the edge. 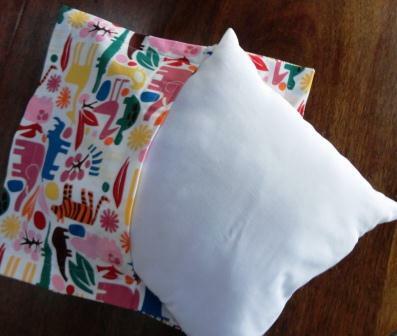 Stuff pillow form into completed pillow sham. 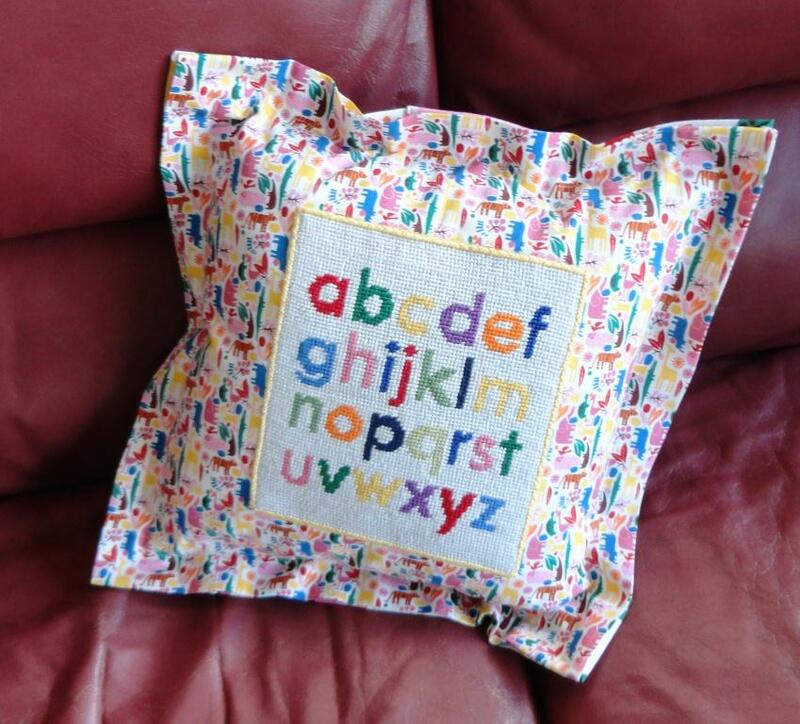 This method works well for a casual cushion and especially well for a child’s pillow because the finished needlepoint can be easily removed and the pillow sham washed. I had a chance to work next to June McKnight a few weeks ago and listen in on some interesting needlepoint discussions. 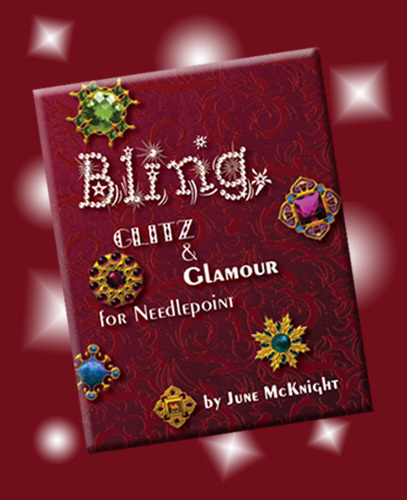 One of the fun things that needlepointers have been doing more of lately is embellishing their needlepoint designs with “Bling”. This not only shows you how to use beads and drops with stitches, it also tells you where to get them. 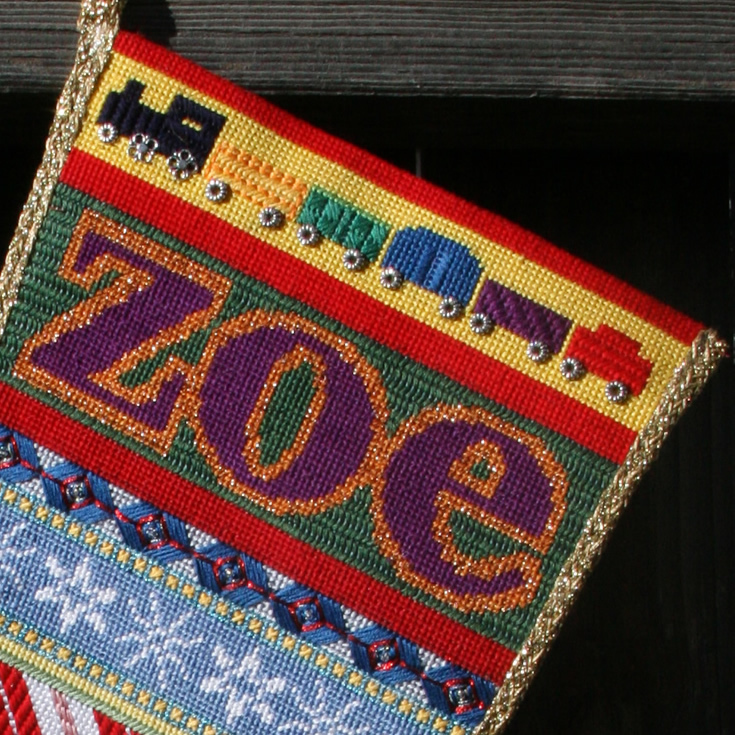 Blinging works well on all types of needlepoint kits, including christmas! You can see Peggy’s bling on her last needlepoint christmas stocking. Peggy added some Needlepoint Bling to Christmas! I was cleaning out the attic the other day (I know, it isn’t the time for Spring cleaning, but with3 feet of snow on the ground cleaning the attic sounded like more fun than shoveling the driveway) and I found the original test needlepoint kit which we did for Needlepaint. It was languishing away because we hadn’t really thought the end product through. The needlepoint canvas was a strange size, 6″ x 7″, so it didn’t fit in a standard frame. By coincidence that colors matched the decor of my granddaughter’s bedroom. It would work on a pillow. My original idea was to use it an an insert, but after looking through my favorite needlepoint book The Needlepoint Book by Jo Ippolito Christensen, I decided that if I used Jo’s binding technique I would get a finish edge in a contrasting color. 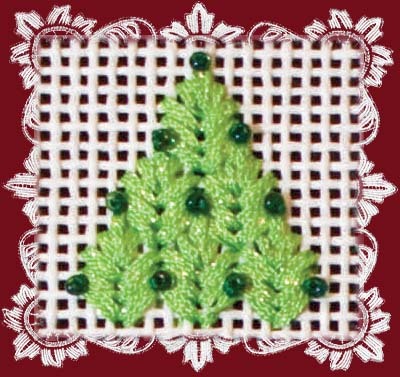 The stitch is a variation of the fern stitch that is worked over two threads of the canvas instead of three. The Needlepaint piece could then be sewn onto the pillow and could then be removed easily if the pillow needed washing. 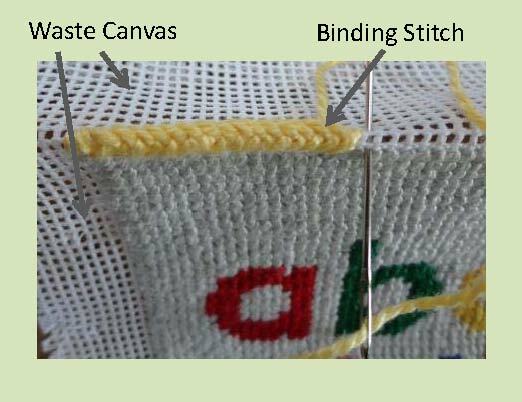 Do not trim the canvas before doing the binding. Block the canvas if necessary before binding. Fold back and steam waste canvas in place before binding. 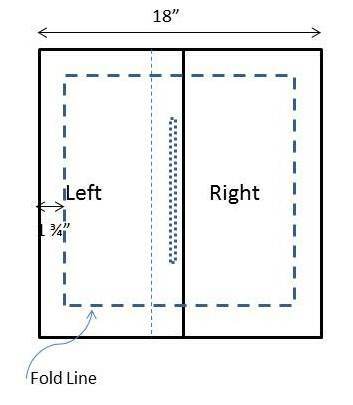 Trim waste canvas to 1/2″ after binding. Coming soon, the finished pillow! 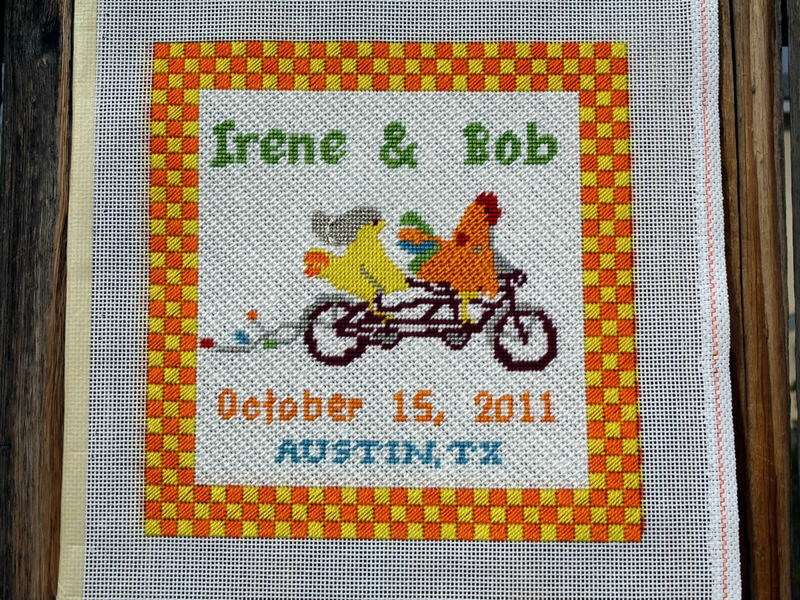 Not only was this a fun project to design, but it also was a great opportunity for us to test out our new needlepoint finisher and our pillow finisher. I’ve used them 5 times so far, as can be seen on the cat needlepoint post and in our newsletter, but this time the stitcher got away from the tent stitches and she decided what stitches she thought would look best. 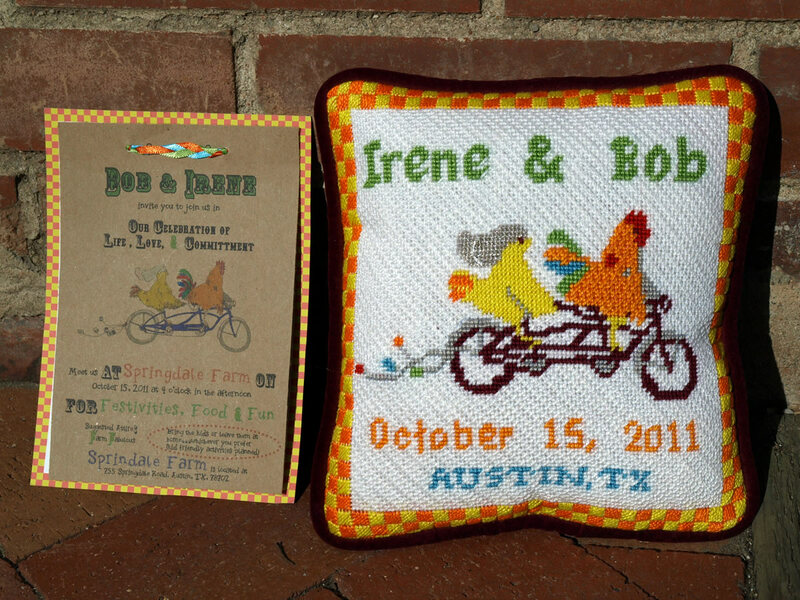 Designing the pillow was relatively simple, I used Bob and Irene’s wedding invitation for my design inspiration, and made some alterations in photoshop. You can see I even used their invitation for matching the colors. We used a burgundy velveteen backing for the pillow, and the contrast looks great. My only regret on this project, is that I think I should have made the pillow 12 x 12 rather than 8 x 8. It does not cost much extra to put a ‘frame’ around the needlepoint, and I think fills out better on a sofa. If you have a project that you don’t have time for, we can make it for you. Our prices start at $2 per inch for stitching, $50 for custom needlepoint kits, $60 for pillow finishing, or $160 for a complete custom ring bearer pillow.